Quantitative easing: The Fed expands its balance sheet by buying Treasuries and MBS. Current pace: $85 billion each month. Quantitative accommodation: The Fed maintains its balance sheet; it buys new assets to replace older ones as they mature. Quantitative tightening: The Fed contracts its balance sheet by allowing assets to mature without replacement or, more aggressively, by selling them. 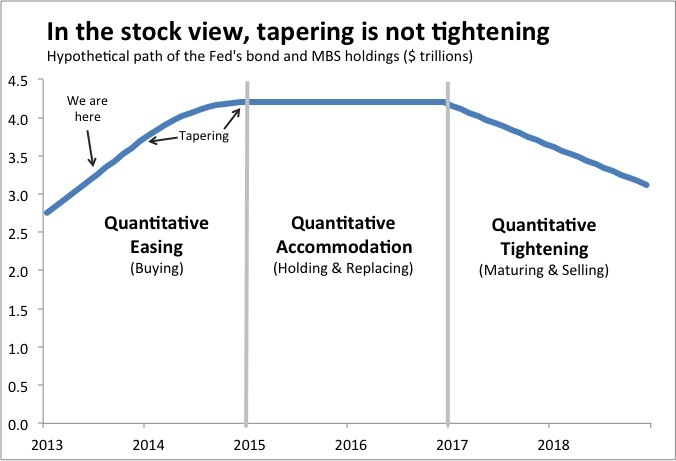 In this view, tapering is the final stage of quantitative easing. The Fed buys assets during tapering, but at a slower tempo. 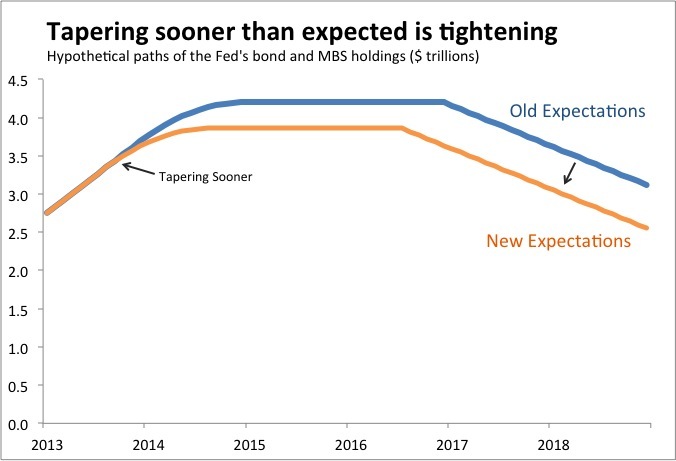 Tapering is not tightening. That view is clear, logical, and elegant. But it utterly fails to explain why financial markets went haywire last week when Ben Bernanke and company talked about tapering. One reason is investor expectations. The Fed has been trying to stimulate the economy not only through QE, but also by telling investors to expect easing in the future. Such forward guidance can be a powerful lever for monetary policy. This view likely explains some of the market reaction to recent Fed statements. But it’s hard to reconcile the magnitude of the movements. Suppose markets expected tapering to begin in January and now think September more likely. All else equal, that four-month difference implies a $340 billion reduction in the Fed’s ultimate portfolio. That’s something, but could that alone explain the sharp market response? Perhaps the flow of Fed purchases matters, not just the stock. This view appears much more common among traders than Fed economists. If anyone has a reference for a good articulation of this view, I’d love to see it. The flow shouldn’t matter in normal times—was the Fed tightening when the flow of purchases was essentially zero for decades before the recent crisis?—but these are hardly normal times. Perhaps the flow matters when you are at the zero lower bound? Perhaps something else also happened. Scott Sumner discusses one possibility: turmoil in China’s financial sector spilling over into U.S. markets. * This definition of tightening compares the new expected trajectory of Fed holdings to prior expectations. Such comparisons are relative; in principle, one could equally say that the Fed announcement indicated that future policy would be less loose, not that it would be tighter. But for most purposes, it seems simpler just to say that future policy has gotten tighter. The same semantic issue exists in fiscal policy. If Medicare spending is scheduled to grow $35 billion next year, what do we call a proposal under which spending increases $30 billion? We usually call that a $5 billion spending cut since it’s a decline relative to an accepted baseline. But we should remember that Medicare spending is growing. The same seems true with early tapering. 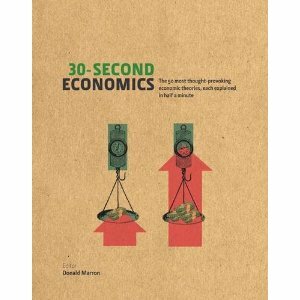 Tightening seems the cleanest description for most purposes, even though in absolute terms it is slower easing. When policy folks talk about America’s federal borrowing, their go-to measures are the public debt, currently $12 trillion, and its ratio to gross domestic product, which is approaching 75 percent. Those figures represent the debt that Treasury has sold into public capital markets, pays interest on, and will one day roll over or repay. These debt measures are important, but they paint an incomplete picture of America’s fiscal health. They don’t account for the current level of interest rates, for example, or for the trajectory of future revenues and spending. A third limitation, the focus of this post, is that the public debt doesn’t give Treasury any credit for the many financial assets it owns. 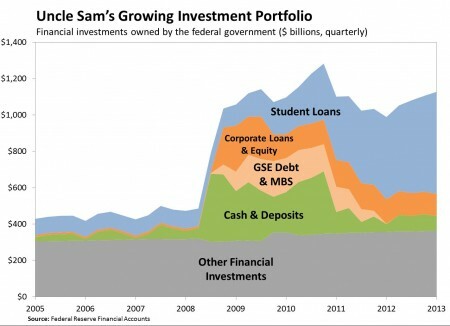 As we noted last week, Uncle Sam has been borrowing not only to finance deficits but also to make student loans, build up cash, and buy other financial assets. That portfolio now stands at $1.1 trillion, equivalent to almost one-tenth of the public debt. Those assets have real value. They pay interest and dividends and could be sold if Treasury ever cared to. In fact, Treasury has sold many financial assets in recent years, including mortgage-backed securities and equity stakes in TARP-backed companies, even as it expanded its portfolio of student loans. One way to take account of these holdings is to subtract their value from the outstanding debt. The rationale is straightforward. If Ann and Bob each owe $30,000 in student loans and have no other debts, they both have the same gross debt. But that doesn’t mean their financial situations are the same. If Ann has $10,000 in the bank and Bob has only $5,000, then Ann is in a stronger position. Her net debt is $20,000, while Bob’s is $25,000. The same logic applies to the federal government: $12 trillion in debt is easier to bear if the government has some offsetting financial assets than if it has none. That’s why both the Office of Management and Budget and the Congressional Budget Office regularly report the public debt net of financial assets. The net debt isn’t a perfect measure; many assets are harder to value than Ann and Bob’s bank accounts, and official valuations may not fully reflect their risk. 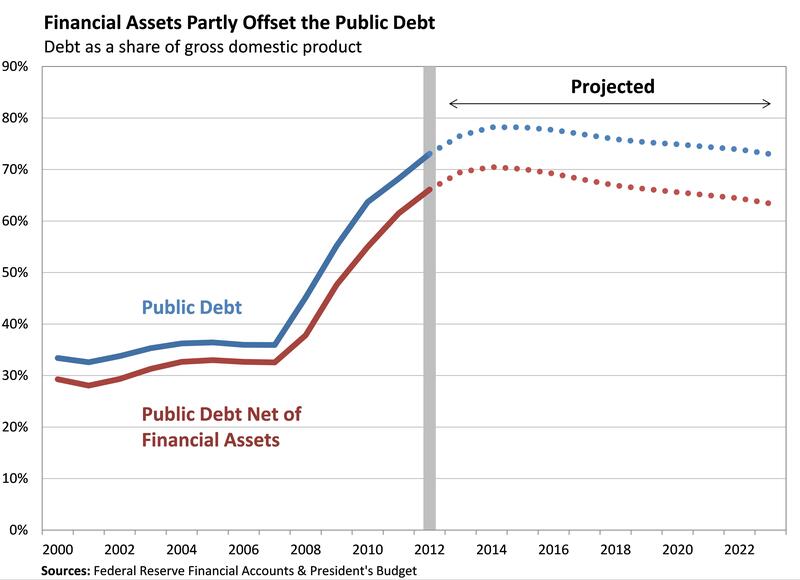 Nonetheless, as CBO has said, the net public debt provides “a more comprehensive picture of the government’s financial condition and its overall impact on credit markets” than does the gross public debt. The net debt is now a bit less than $11 trillion or about 68 percent of GDP. That’s more than $1 trillion less than the usual, gross measure of public debt, or about 7 percent of GDP. That difference was only 3 percent of GDP as recently as 2006. Under President Obama’s budget, it would expand to almost 10 percent by 2023, with financial assets growing twice as fast as the public debt. Financial assets are thus playing a bigger role in America’s debt story. Accumulating deficits remain the prime driver of the debt. But the expansion of Uncle Sam’s investment portfolio means the growing public debt overstates America’s debt burden. This post was coauthored by Hillel Kipnis, who in interning at the Urban Institute this summer. The federal government has been borrowing rapidly to finance recent budget deficits. But that’s not the only reason it’s gone deeper into debt. Uncle Sam also borrows to issue loans, build up cash, and make other financial investments. Financial crisis firefighting drove much of the increase from 2008 through mid-2010. Treasury raised extra cash to deposit at the Federal Reserve; this Supplemental Financing Program (SFP) helped the Fed finance its lending efforts in the days before quantitative easing. Treasury placed Fannie Mae and Freddie Mac, the two mortgage giants, into conservatorship, receiving preferred stock in return; shortly thereafter, Treasury began to purchase debt and mortgage-backed securities (MBS) issued by Fannie, Freddie, and other government-sponsored enterprises (GSEs). And through the Troubled Asset Relief Program (TARP), Treasury made investments in banks, insurance companies, and automakers and helped support various lending programs. Together with a few smaller programs, these financial crisis responses peaked at more than $600 billion. Since then, they have declined as Treasury sold off all its agency debt and MBS and most of its TARP investments and as quantitative easing, in which the Fed simply creates new bank reserves, eliminated the need for cash raised through the SFP. Those declines have been more than offset by the government’s growing student loan portfolio. The federal government used to subsidize student borrowing not only by providing loans directly to students, but also by guaranteeing many private loans. In 2009, however, Congress eliminated private guarantees and dramatically expanded direct federal lending. The government’s portfolio of student loans has since increased from about $90 billion at the start of fiscal 2008 to more than $560 billion today. As a result, the government’s financial investments now total about $1.1 trillion, essentially all of which was financed by borrowing. The debt supporting Uncle Sam’s investment portfolio thus accounts for almost 10 percent of the $11.9 trillion in public debt. Source: The Federal Reserve Financial Accounts (formerly known as the Flow of Funds), Daily Treasury Statement, and the President’s Budgets. The figures here compare balances as of March 31, 2013 (most recent available) with balances as of September 30, 2007 (the end of fiscal 2007). We define financial investments to be all the federal government’s financial assets except for official reserve assets, trade receivables, and tax receivables; this definition approximates those used by the Office of Management and Budget and the Congressional Budget Office in certain debt calculations.